Folks, this day had to come. Projects born and die by the hand of their masters and this is no exception. Bird Paradigma was born in 2011 by means of total improvisation. It was never just a noise project, it was never dark ambient or industrial, or even metal, but it was an all-in-one experience. Much more than I wanted it to be. The natural path was the disintegration of the project's primal identity, which was noise only. I introduced melodies and electronic elements that softened the music and at the end of the day this wasn't a project anymore. It was just me doing things, without any kind of structure or objective. A music track started and ended in itself and that was the soul of the project, or was it really my soul? And the other artist's influences, being them music or artwork, shaped a bit what Bird Paradigma came to be. The collaboration with others was something that I cherished and still cherish and the main good thing that I took from this experience. The contacts that persisted until today are contacts that I want to have for many years to come, maybe for future projects. I think that 5 years for a first noise project, solo, no gigs, are more than enough. What I want for the future is making music or noise a bit more detached from the core of my spirit and try to channel again the consequences of my troubles, and come up with something that is not just a tiny bit of my spirit or intentions but something new and transformed. Those channels are a bit rusty now and need to be rebuilt. I want to come up with something not-mine. Thing is that now I don't have time, technological means or enough physical and mental space to transfer the elements inside me to the outside. I need to re-learn to make things without the resources I had and with the life I am living now, with more pets, with a partner, a smaller house, plants to care, languages to learn, artworks to craft, sports to practice, people to talk with, tapes to collect, distro to sell, day job to do, reviews to write, family to visit, movies to watch, books to read, dreams to plan. So what I look for is a spontaneous kind of expression - and Bird wasn't being spontaneous - and perhaps a more anonymous kind of work, where my face doesn't show up but my sounds and words do. Or, on the contrary, to show, to appear, to be there, I don't know. So, thank you all for your support. Bandcamp link is the main source for my music and I will upload more unreleased music. I do not even know what I really released because of compilations that I lost track of. But let's be honest, to post something on a "net label" is really to "release" something? For me a release needs to have body, call me old-school, but the releases I loved the most were the releases that reached the physical formats by small independent labels that believed in my work. The others are just sonic dust scattered along the internet. Are you really gonna listen to them, start to finish, without skipping tracks? I don't believe so. Will you insert a tape on your stereo or a CD, and listen to it, after buying or robbing it, because you handpicked it? I tend to believe you'll do so. This is just my opinion, I'm not against net-labels, what I don't believe though is that the digital release is final and I am proud that Bird Paradigma was an online-only presence that reached someone out there beyond the online world. That reaching is the final product, the final destination and that was something real, physical and not just 1s and 0s that will disappear or become quirky with time, or even, be lost in some internet so-called "archive", that you know is synonym of "thrash can". As an archivist I know that is very very hard to keep those digital objects alive, and even if we can do it, we can't fight "vergessenheit", because they are so so many and so so obscure. But that little tape in your shelf, that you'll listen to, resell on ebay, throw away, is something you'll "perform" with, it's something that requires your action to be or to cease to be. So, fist I want to thank my independent labels that, with an open mind, believed and invested in my work. Second, thanks to net-labels that published my work to promote it. Third, thanks to other noise and experimental artists that walked this path with me, even though I never met you in person (I'm shy). And fourth thanks to close friends and family that hated every bit of my music but supported the idea anyway. This page will be online, possibly with some updates about Bandcamp. Not some great news to display lately, but as Bird Paradigma was a stillborn not many years ago, it's now half-dead. Since it's just an half part, the other half is still trying to produce some significant sound experiences that could amuse its creator. It's been happening at a very slow pace, but why hurry, right? I am now able to create an EP, solo or in a split with another artist and release it through name-your-price download on Bandcamp or in a physical format. Like I stated before, I lost the means to dub tapes so that will not be an option, at least without finding a label. CD-R has always been an option though, I'm still thinking about to pursue a DIY release project in that format. It won't be anything fancy or expensive. My latest tape DIY release on tape is still available in very limited quantities. You can check it at Discography [physical] tab and contact me for prices and shipping costs. Collaboration work with Wilhelm Matthies is out now on Petroglyph Music. Check Discography [digital] to stream or download the album! A split cassette tape between Bird Paradigma and marcjacobsmodel was released on Love and Be Judged limited to 10 copies and available online for streaming. Just follow the link above or go to Discography [physical] to enjoy it! Updates made to projects in motion and discography [digital] sections. Since I'm currently not planning any release soon, please check soundcloud to listen to the latest themes I've been working on. Now available for download (CS sold out) "Arrayed for Sentencing" split album with elizabeth Veldon. Here. A split cassette album with Elizabeth Veldon is being created and produced. An interesting concept is going to be approached by means of sound and speech. It has passed some time since I updated the Bird's headquarters. Within me, the Bird-alter-ego-trip is always present, but sometimes it's hidden from the world. I hope I can warm your ears in a bad way with my last sounds on soundcloud and with this next split I am working on. I believe in Elizabeth's work and I am glad to make music with her besides the geographical hindrance that separates us. That's what virtual resources are for. Some tracks were added to Soundcloud and are available at the Latest sounds tab. They are the first in the playlist and show the usual opposite sides of Bird Paradigma sounds, which now has a new partner - The Improbable Archivist. It's an "it" entity that helps the Bird run it's noise errands. Hope you enjoy it and keep following this page. Latest album of year 2012 is released on portuguese netlabel MiMi Records and available to listen/download at their website. Discography [digital] section is updated with some data and a review written by Wilhelm Matthies. Bancamp updated! A few free splits, albums, paid goodies, albums, almost everything is available. Enjoy. To mark the ending of this year, Den of Dead Trees released this compilation of unreleased Bird Paradigma material. Free download here. Updated some content on digital discography and projects in motion. Been doing some splits and participating in several compilations. Everything's online and some of it <free> <download>. Interview with Bird Paradigma at Fungus Cerebri Mag from the Spanish noise scene. "13 questions to Bird Paradigma" were answered at the Kultur Terrorismus music blog. Please ckeck the link here and enjoy. Zeon Light Tapes kindly released Bird Paradigma in a C30 including music made with this very release in mind. It was a great experience to work with them. C30 format fits the Bird's sound concerning lenght and Word Geometry has born to colorize your ears with improvisations, experimental electronics, free jazz and noise. 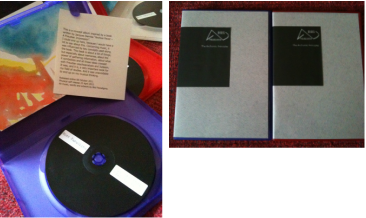 Bird Paradigma - The Archontic Principles [BP003-CDr] full-lenght DIY release it's available at the Discography section. Comming soon on Zeon Light Tapes. A (DIY)l self-release is being created. Working on Activation Congress live appearances which keeps me very busy. Some new stuff is ecloding and presented under the Sound tab at this website. Due to restricted space on Soundcloud some works are being replaced by new ones. I'm trying to group those experiences under some context and make some sense out of them. Or... discovering the sense that lies underneath. __Bird Paradigma is closing the 2011 activities. Too much happened concerning musical creation. I would like to thank you all for your support, for stopping by, listening, releasing and collaborating with me. Ok, if I step upon an inspirational moment of course I will share it with you. But albums, EPs, digital releases, etc., just for 2012. I will continue to work on The Archontic Principles physical release. It's very simple stuff. I just don't have enough time to work on it. So don't create (great) expectations. Discography section updated with new free download album 8Bit Chocolate. "Sound" section updated with new collaboration work and "Projects in Motion" has my last contribution to the underground weird stuff happening these days. Finally I finished The Archontic Principles conceptual work. You can listen to it on Discography tab or visit the Bandcamp link above, so you can have access to all releases. Of course I will make a DIY release to please your physical musical needs. Step by step now. It's on the run a small experimental project in 8bit (I always wanted to work with low bitrates, so now's the time) that I want to release on a simple slipcase. First it will be available at Bandcamp because I can't keep my work inside the (virtual) drawer for too long. Some splits and collabs are also on the table but I'm very short of time, so let's see what I can accomplish until the end of the year.